Gregory J. Klomp, 71, of Sugar Grove, Pa., passed away Tuesday, Sept. 4, 2018, at his home. He was born Nov. 14, 1946, in Jamestown, N.Y., a son to the late Cornelius and Audrey (Engblom) Klomp. Greg was a U.S. Army veteran, serving in Vietnam and worked for Jamestown Fabricated as an iron worker. He was a member of the Sugar Grove American Legion Post 758, AMVETS Post 50 and a lifetime member of the NRA. Greg enjoyed Mediumship and Reiki classes as well as watching NASCAR and football, riding his Harley, water fowl hunting and was an avid collector. He was a conservationist and taught the hunter safety course for many years. 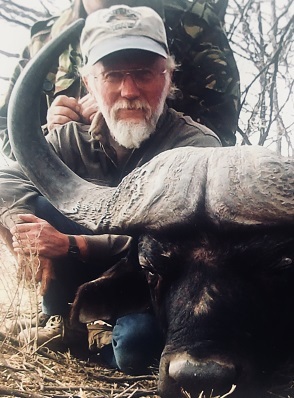 His trip of a lifetime was in 2008 when he went on a big game hunt in Africa. Greg is survived by his wife, Cindy DuVall-Klomp of Sugar Grove, Pa.; his daughters, Lynette (Bump) Hedman and Raye Abbott and her companion, Troy Johnson, both of Sugar Grove, Pa.; his step-daughters, Ami DuVall of Jamestown, N.Y., Julie Waterman of Olean, N.Y., and Jennie Waterman of Corry, Pa.; his grandchildren, Amber (Justin) Curtis, Mitchyl, Lakia and Easton Hedman; his step-grandchildren, Salyna, Shawn and Toby Patterson, Morgan and Madison Blose and three great-grandchildren, Kinley, Leyton and Landry Curtis. A celebration of life will be held on Wednesday, Sept. 12, from 5-7 p.m. at the AMVETS Post 50, 3838 Stoney Run Road, Sugar Grove, Pa. The Youngsville American Legion Honor Guard will provide military honors at 5 p.m.
Memorial donations may be made to the Sugar Grove American Flag Project, AMVETS Post 50, PO Box 502, Sugar grove, PA 16350 or to a non-kill animal shelter of your choice. The Nelson Funeral Home & Cremation Services, in Youngsville, have been entrusted with all arrangements. Condolences to the family may be made at www.nelson funeralhome.net.